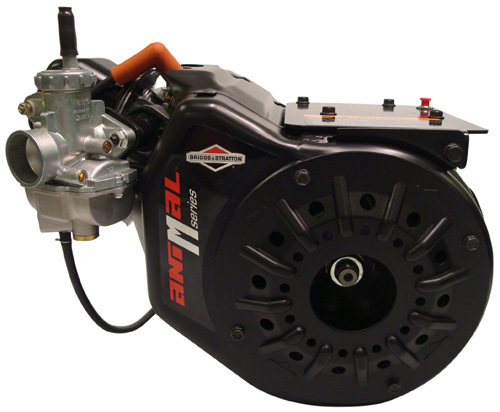 The M-series is built from dedicated tooling and dies used only in the production of racing engines. This is the foundation for long-term consistency. The M-series will go a step further with each engine utilizing a single head casting. Each engine will feature a new ground cam design for easy starting, a digital ignition system with a 6,100 RPM rev limiter to eliminate spring changes, a new control plate design for a drop-in fit, and a carbon-steel, splined crankshaft that mates right up to our 555721 gearbox. Other features include a fire-ring head gasket, Walbro Carburetor, Federal Mogul barrel-ground, eutectic piston, Goetze piston ring set with chrome-faced top ring, and TRW dished valves. The Animal M-series, 124332 8203-01, will be available for dealer orders September 17, 2010. For upcoming details on the M-series along with specifications and a complete list of features visit www.BriggsRacing.com or drop us an e-mail at Briggsracing@basco.com.